Planning a wedding can be an exciting time, not just for the bride, but for the couple as a whole. After all, not only is your wedding the one day that can be all about you, but it’s the day you officially commit your lives to one another. That being said, there’s no shortage of plans or decisions to make from your venue to your colors, cake, and flowers. Ergo, most couples opt to focus their big day on one central theme to help narrow down some of the choices and tie every detail together. While a choice on theme can help the happy couple knock out some of those decisions, your theme also has the ability to affect your cost as well. There’s no question that having a destination wedding, a glam wedding, or black tie affair are bound to increase the price at the end of the day. Weddings are costly affairs and there’s no way around it, however, you can make choices to keep the price at bay. If you’re planning a wedding, and hoping to do so at a more inexpensive cost, consider opting for one of these six cheap wedding themes. When it comes to a wedding the venue can be one of the most expensive parts. Plan a rustic wedding, however, and your venue options might come at a less expensive cost. For a rustic theme places like a public park, someone’s backyard, a garden, or even camp area would be a great fit, all at a cheaper price. When it comes to decoration, flowers can be of the inexpensive wild flower variety and burlap and twine tend to be great accents, all elements that come cheaply. Moreover, rustic tends to sway on the simpler side when it comes to decor, that plus your outdoor venue means you won’t have to spend a fortune to make your wedding special. Vintage themed weddings are a great way to utilize what you already have and what you can likely find and borrow from family and friends. From the dress to the decorations, depending on where buy them, your vintage finds will usually come at an inexpensive price. Use lace, which can be found cheaply at most craft stores, to drape throughout the venue and decorate the tables. Seek out old antiques like tea cups, vases, and old frames to utilize as centerpieces and you’ll have a vintage themed wedding at a low cost. While many couples choose to get married in the spring or summer, if you have a tendency to like the cooler weather, consider having a holiday themed wedding. Come the holidays, just about every store, hotel, home, church, and every other venue you can think of are already filled with decorations. Instead of spending hours and money decorating, you can utilize the trees, poinsettias, and other Christmas decor already a part of your venue and incorporate it into your own. Furthermore, since you’re going for a holiday theme, you’ll save money on flowers by opting to put seasonal greenery and plants into your bouquets and centerpieces. Much like a rustic wedding, a whimsical wedding is usually centered around an unconventional venue. By thinking out of the box and opting for a place like a library, museum, or public beach, you’ll have a fantastic background to your whimsical theme at a low price. Another great way to save with this theme is through your food as well. Instead of the usual plated meal, think of appetizers and finger food or choose an unlikely contender like tacos or bbq. Moreover, part of going with a whimsical theme is being playful and unique with your decor. Think tea lights, wine bottles for center pieces, colorful lanterns, and other Etsy-like options that can all be done yourself or inexpensively. Bohemian tends to be a theme that’s a little simpler in some aspects. This can help keep your wedding budget in check. Instead of going with the upcoming wedding trends, a bohemian wedding is all about doing things a little more offbeat. It’s about following your tastes and straying away from the typical. This will already set you up to save money here. In terms of dresses and suits, think simpler and just about anything. With a bohemian wedding there’s no need to have an actual wedding dress or tux. Instead, opt for unique, less formal options or consider looking at other formal wear. Lastly, when it comes to decor, think similar to whimsical or get creative. Bohemian tends to stray away from the norms. This means you can find other, cheaper flowers for bouquets and center pieces. Think succulents or daisies and inexpensive trinkets and items to fill the venue. Similar to a rustic wedding, a country or western wedding is all about the simpler things. Think of a barn for your venue, inexpensive table runners and cloths like burlap, and possibly even hay bales with blankets for seating. Save money on food by opting for bbq and possibly even having homemade pies as your main dessert option. For a country wedding the simpler, traditional foods not only go with the theme, but come at a cheaper price. Furthermore, for decor on a budget, again, utilize those mason jars as hanging lights or even drink ware. You can use metal tins for centerpieces. Use your Christmas lights for accent lighting. Plus, you can use wildflowers for a bouquet. All together every aspect will create that country atmosphere and keep you from blowing your budget. It’s understandable to want to go all out for your big day; after all, it is supposed to be one of the most important days in your life. Nonetheless, you can have a truly spectacular wedding day without spending a fortune. 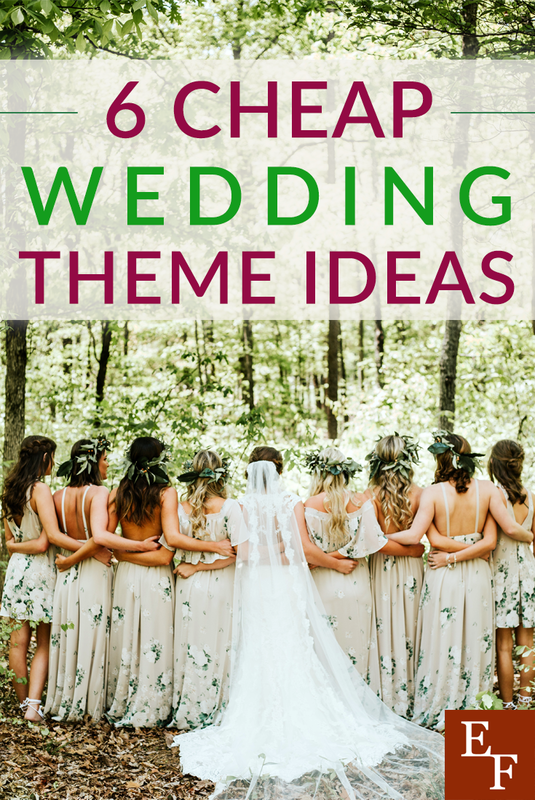 Consider opting for one of these unique and cheap wedding theme ideas. You’ll not only a beautiful wedding, but one that keeps the stress of money at bay. By doing so, you’ll be able to truly enjoy your big day. You’ll remember all the fun you had instead of all the money you spent. What are some other cheap wedding theme ideas you can think of? What theme did you choose for your wedding?